Tony Hawk\'s Pro Skater 2x is basically a graphically enhanced version of the original Tony Hawk\'s Pro Skater 2, with a whole bunch of new features. In addition to all the levels from THPS2, it includes every level from the original THPS, plus 5 brand-new exclusive ones, making a total of 24 levels. Of course, if you have enough creativity, you can also create your own parks to skate on with the returning \'Park Editor\' mode. The game\'s \'Create-a-Skater\' mode has also been updated, allowing female skaters to be created. Taking advantage of the Xbox\'s built-in hard drive, THPS2x supports custom soundtracks, which means you can store tracks from your CD\'s onto your Xbox, and then listen to them while playing the game. Last, but definately not least, the multi-player aspect of the game has been greatly improved, allowing up to 4-player split-screen play or 8-player system-link play. Everything plays the same way as Tony Hawk\'s Pro Skater 2. The classic gameplay is very easy to learn, yet the game itself gets increasingly difficult, as not to get boring quickly. Nothing amazing by today\'s standards, but it does look much better than THPS2. I have no real complaints here. I didn\'t notice anything different than the original THPS2. The music and sound effects seem to all be the same. The inclusion of songs from the first THPS would\'ve been nice, but the custom soundtrack feature easily makes up for it. The box says, \'Mild lyrics\' and \'Suggestive themes.\' You do not, however, have to listen to their music. I always prefer listening to my own custom soundtracks, but when I have listened to the game\'s music, I haven\'t noticed anything bad. As for suggestive themes, I honestly didn\'t notice any of those either. There is blood when you fall, but there is a cheat to disable it. One thing that I would note, is that one level requires you to \'Ollie the Magic Bum 5x.\' Most people probably find it funny, but I see it as being cruel. Still, this is a fairly light-hearted game, that people shouldn\'t find very offensive, if at all. 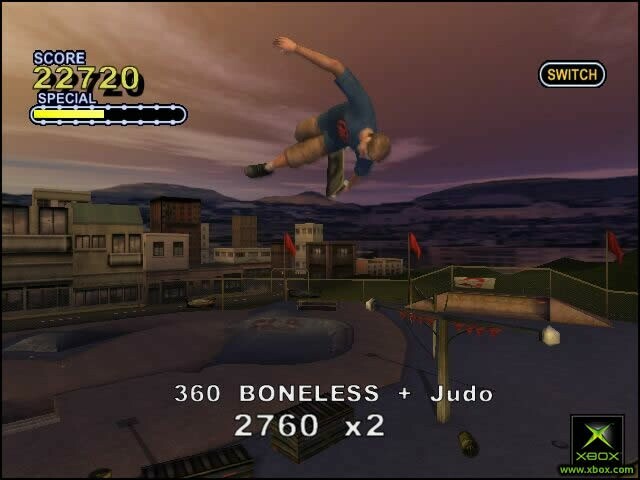 I can easily recommend Tony Hawk\'s Pro Skater to anyone. Its tried-and-true formula still remains fun after all these years. With all of the additions, this is a must-have for any fan of the series, as well as anyone just looking for a good game that anyone can enjoy.